Aga Khan (Arabic: آغا خان‎, Persian: آقاخان‎; also transliterated as Aqa Khan and Agha Khan) is a title held by the Imām of the Nizari Ismāʿīli Shias. Since 1957[update], the holder of the title has been the 49th Imām, Prince Shah Karim al-Husseini, Aga Khan IV (b. 1936). The current Aga Khan, pictured in 2014. The title is made up of the titles "agha" and "khan". The Turkish "agha" is "aqa" (Āqā) in Persian. The word "agha" comes from the Old Turkic and Mongolian "aqa", meaning "elder brother", and "khan" means king, ruler in Turkic and Mongolian languages. According to Farhad Daftary, a scholar of the Ismaili movement, Aga Khan is an honorific title bestowed on Hasan Ali Shah (1800–1881), the 46th Imām of Nizari Ismailis (1817–1881), by Persian king Fath-Ali Shah Qajar. However, Daftary apparently contradicts what the Aga Khan III noted in a famous legal proceeding in India: that Aga Khan is not a title but instead an alias that was given to the Aga Khan I when he was a young man. During the latter stages of the First Anglo-Afghan War (1841–1842), Hasan Ali Shah and his cavalry officers provided assistance to General Nott in Kandahar Province and to General England in his advance from Sindh to join Nott. For these and for other diligent efforts made by him in the service of the Empire, the British Raj recognised him as a "Prince". This title was less extraordinary in that time and place than it seems today, because the British, while consolidating their hold on India, had been handing out similar titles liberally to any large landowner or tribal chieftain with local influence who made himself useful to them. The Aga Khan was exceptional in that, while it was local tribal influence which had enabled him to serve the British and gain their favor, his claim to nobility was based upon his claim to leadership of an entire sect of Islam. Imperial Britain saw great possibilities in having under their control and patronage the head of a major Shia sect; it could even be used at some later stage to counterbalance the influence of the Ottoman Caliph, the head of Islam as recognized by the Sunni sects. In pursuance of this grander narrative, and recognizing that his pretensions and Anglophilia were alike repugnant to the tribes then under his influence, he was awarded the status of "Prince" by the British government's representatives in India and became the only religious or community leader in British India granted a personal gun salute. When Hasan Ali Shah, the first Aga Khan, came to Sindh (which is now in Pakistan) from Afghanistan, he and his army were welcomed by Mir Nasir Khan of Baluchistan. In 1866, the Aga Khan won a court victory in the High Court of Bombay in what popularly became known as the Aga Khan Case, securing his recognition by the British government as the head of the Khoja community. 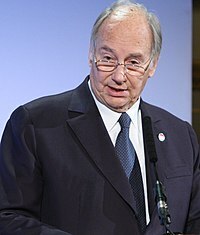 The Aga Khan is also the Pir within the Nizari Ismaili community. In 1887, the Secretary of State for India, acting through the Viceroy of India, formally recognized the title Aga Khan. ^ Daftary, Farhad (2007). The Ismāʻı̄lı̄s: their history and doctrines (2nd ed.). Cambridge University Press. ISBN 978-0-511-35561-5. ^ "the definition of aga". Dictionary.com. Retrieved 17 June 2016. ^ "imla". www.nisanyansozluk.com. Retrieved 17 June 2016. ^ Fairbank, John King (1978). The Cambridge History of China. Cambridge University Press. p. 367. ^ "The Institute of Ismaili Studies". Archived from the original on 12 May 2013. Retrieved 2 April 2013. ^ Daftary, Farhad (2004). Ismaili Literature: A Bibliography Of Sources And Studies. Institute of Ismaili Studies. ISBN 978-1-850-43439-9. ^ Russell, Justice. "Haji Bibi vs H.H. Sir Sultan Mahomed Shah, 1 September 1908". indiankanoon.org. Indian Kanoon. Retrieved 14 November 2018.